Made from two cardboard boxes, some clear plastic wrap, and a little tape. You can build a nearly free solar dehydrator. Set it on a stool or chair and face it's solar collector towards the sun, and you have a functional food preservation machine for little work and even less money. The above picture almost says it all. Using a long thin cardboard box for the collector and a taller, nearly square, cardboard box for the drying box. Boxes could be made to size by cutting and taping together small cardboard pieces. Line the bottom of the collector box with a black plastic garbage bag or paint the bottom with black, water based, poster paint, (lamp black or soot mixed with a little vegetable oil would work as well). If you use spray paint or other toxic paints, let the collector bake in the sun for a day or two before use. 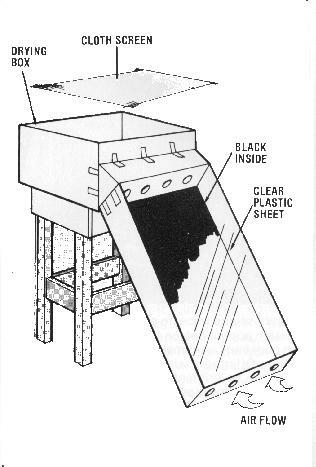 Cover the top of the collector with clear plastic wrap or window glass, etc. Tape it together as shown. To increase the efficiency, you may want to cover the sides and bottom of both boxes with fiberglass or styrofoam insulation. Rely on appearance and feel to judge dryness. Cool a test handful a few minutes before deciding whether the food is done. Consider fruit dry when no wetness can be squeezed from a piece which has been cut - it should be rather tough and pliable. Consider vegetables dry when brittle. Steam blanching is safe pre-treatment which can prevent spoilage - especially of low acid foods such as vegetables. Conditioning - i.e. leaving in open air for long periods to equalize moisture content. Ensure food is thoroughly cool before storing. Store in small quantities in glass or food-grade plastic. Check supplies frequently for contamination or dampness. Keep in a dry, cool place (between 4 C/40 F and 21 C/70 F). Fruits - cover with boiling water in saucepan and simmer the fruit covered for 10-15 min. - sweeten to taste at the very end of cooking. - remove from heat and cool still covered Vegetables. - soak all vegetables except greens in cold water until they are nearly restored to their original texture. - use only enough water to cover and always cook in the soaking water. - cover greens with enough boiling water to cover and simmer until tender.